All IAS aspirants need to crack the IAS Mains Exam not only successfully, but also meritoriously. Well, if you are an IAS aspirant, you are required to qualify the Prelims, and score well in the Mains before overcoming the final hurdle i.e., the Interview which is often referred to as the Personality Test. If you have been thinking of the best strategy to prepare for the IAS Mains Exam, it only implies that you might have already cleared the IAS Prelims Exam successfully and now you are planning to focus entirely for the preparation of the IAS Mains Exam. Or you might have been planning to prepare both for the IAS Prelims Exam and the IAS Mains Exam simultaneously. In case, you have already cleared the IAS Prelims exam, UPSC will ask you to fill in the DAF i.e., the Detailed Application Form. The Interview conducted by UPSC, after you clear the Mains is based (to a considerable extent) on the details that you provide in the DAF. However, there are a considerably huge number of candidates that begin to prepare both for the IAS Prelims exam as well as the IAS Mains Exam simultaneously. In the case specified above, the IAS aspirant needs to be more specific concerning not only time management, but also a number of other skills so that both the IAS Prelims exam as well as the IAS Mains Exam are suitably prepared for as required. 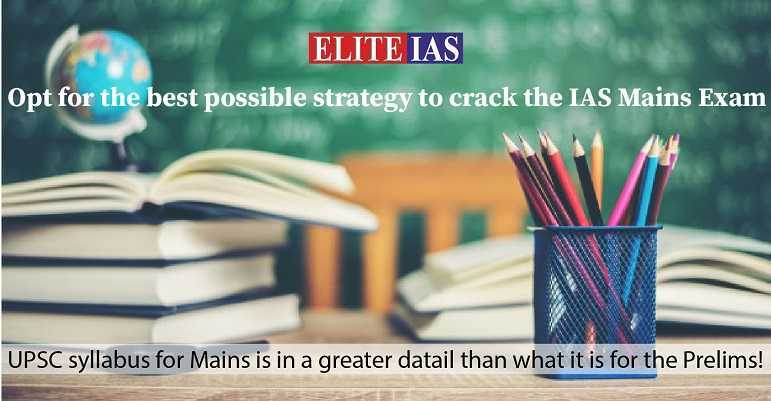 Now, depending upon the case that is applicable to you, as described above, you will be required to choose the best strategy to prepare for the IAS Mains Exam. What if you have not yet qualified the IAS Prelims Exam? As all the IAS aspirants are required to face the challenge to prepare the entire syllabus prescribed by the UPSC, the task gets tougher if you have not already qualified the IAS Prelims Exam. In that case, it is advisable to keep the following points in mind as you will have to prepare both for the IAS Prelims Exam as well as the IAS Mains Exam. Allow yourself sufficient time to prepare well both for the IAS Prelims Exam as well as the IAS Mains Exam: Well, in case you haven’t yet qualified the Prelims, it is advisable to begin with your preparations at least one year before the Prelims exams. Doing so will provide you with time sufficient enough to prepare for both the IAS Prelims Exam as well as the IAS Mains Exam. Keep your responsibilities and daily routine in mind before thinking of the time you will require to prepare both for the IAS Prelims Exam as well as the IAS Mains Exam: No candidate should assume that one year’s time is going to be sufficient for all the aspirants in order to prepare both for the IAS Prelims Exam as well as the IAS Mains Exam. What if you have a full time job that keeps you busy the entire day? Or you might be having any other responsibilities? In that case, it is advisable to begin with your preparation even earlier. It is you who knows best how much of the time you can devote to the preparation for both the IAS Prelims Exam as well as the IAS Mains Exam and that would help you decide how early you should begin with your preparation both for the IAS Prelims Exam as well as the IAS Mains Exam. In case, you have already qualified the IAS Prelims Exam, all what you have to do is to prepare for the IAS Mains Exam. However, cracking the Mains successfully in order to score well and also rank high when UPSC declares the results is a challenging task that no IAS aspirant may take lightly. Here are a few tips to help you prepare for the IAS Mains Exam by helping you to be equipped with the best strategy to prepare for the same. Acquire the suitable study material: Even if you have qualified the IAS Prelims Exams, the same study material is not going to be sufficient for the IAS Mains Exam, as you would be well aware by now that the syllabus that UPSC prescribes is extremely vast. Besides, you are going to prepare for the IAS Mains Exam. So, you are required to study more in detail than what you did for the IAS Prelims Exam. It obviously implies that you should acquire the suitable books and also read the newspapers and magazines as suitably required in order to prepare well. However, it would be useless to raise a pile of books, newspapers and magazines on your study table if you simply cannot read them all. You should have only those books and all other study material that is as par the syllabus prescribed by UPSC. It is best not to divert from the UPSC syllabus: You may find some of the topics prescribed by UPSC more interesting than others. However, it is always best to keep in mind that you have only a limited time ahead. And you can’t go ahead reading whatever you feel like. So, it is best to stick to the syllabus prescribed by UPSC. 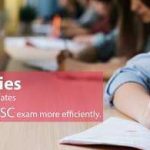 Study as much as is required to clear the IAS Mains Exam and also score well and rank high so that UPSC allows you to join the cadre of your choice. But never forget that in order to manage your time well, you should not make too selective a reading of the books. You should have a strong hold over the topics and/or subjects in order to do well and also compete well with the fellow IAS aspirants when you finally face the IAS Mains Exam. Join a coaching institute: In case, you feel that you need guidance while preparing for the IAS Mains Exam, seek it. It would be best to join an IAS coaching institute in that case. Besides the guidance you would be receiving from the faculty in the classroom, you are going to receive several other benefits that you might not have perceived initially. Joining a coaching institute would allow you an environment to prepare along with your fellow competitors and you would get to know your own pluses as well as minuses far better and hence prepare accordingly. Besides, the test series, various mock tests (and even the mock interviews, as you are going to face the Interview by UPSC when you clear the IAS Mains Exam) are not only going to help you assess yourself better, but also prepare accordingly. Feel confident and do not panic: When you prepare well, you should feel confident that you would be able to not only crack the IAS Mains Exam, but also score well and rank high among the competitors when the results are declared. So feel confident and do not panic for that does not serve any purpose and besides, what all knowledge you might have gained by preparing hard for the IAS Mains Exam would also be rendered a sheer waste! So be confident, cool, calm and poised. Just prepare well and walk into the examination hall confidently and with a relaxed mind. Stay fit and fine: Health is wealth. And a healthy mind stays in a healthy body. These are not just the age old sayings. They also reveal highly important truths of life. All the time you are preparing for the IAS Mains Exam, eat well and take rest whenever you require. It is highly important to stay fit and fine. Otherwise, with a fatigued body and a starved tummy, you would not be able to focus on whatever you study. A good health is going to be a great asset that would definitely help you prepare for the IAS Mains Exam in the best possible manner. Finally, your memory should be sharp enough to remember all you have been studying so far. So, you need to revise as frequently as possible. Revision would help you realize if you have been forgetting something and read it all over again or as required. You may make notes to make revisions easier and quicker. However, it should not be forgotten that you aim at clearing the IAS Mains Exam and also score well and rank high, so it is best to keep all the disturbances at bay and focus on your aim with all your might!